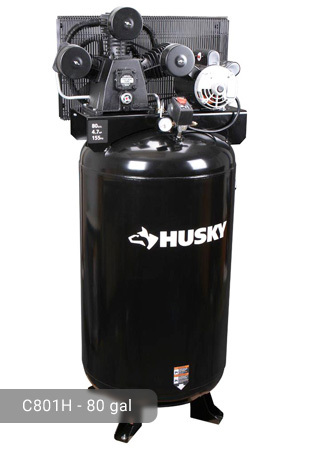 We do not always get the best deal in the things that we purchase but with Husky 80 Gal Electric Stationary Air Compressor, we are assured of a great performance that other models cannot offer. 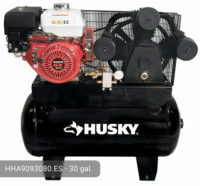 With its 7.5 HP electric motor, it is definitely one of most powerful air compressors that are available right now. It is already pre-wired and features a mounted magnetic starter that can significantly save your time and money. The motor has a Baldor industrial design for durability. Indeed, it is not only an awesome machine but also a cost-effective investment. 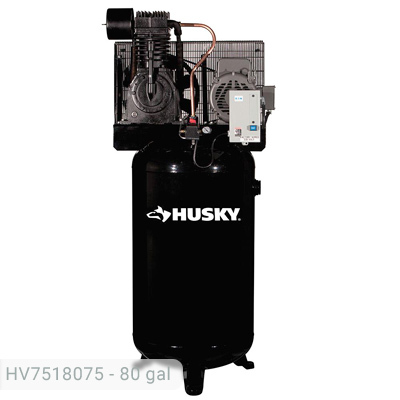 This Husky HV7518075 model also has a pump that was intricately structured to provide the best service that you could ask for. It has hardened disc valves and an oversized taper roller bearings. The cast iron flywheel is fully balanced. Because it is expected to perform heavy-duty tasks, the metal belt guard and splash-type lubrication will be responsible in cooling the pump faster (as much as 60 degrees Fahrenheit over other standard belt guards) than other units. It can deliver 22.1 CFM of air at 100 psi and 21.2 CFM at 175 psi. The maximum pressure is at 175 psi. 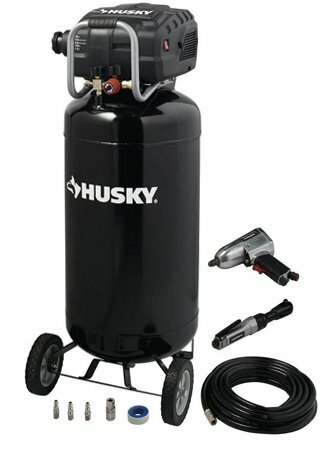 To contribute to the power output of this Husky 80 gallon air compressor, the pump undergoes a 2-stage compression process which helps in powering more than one tool at a time. This way, you can multi-task and finish your projects quickly. With this kind of power, it can perform almost any application such as, but are not limited to, the following: blow cleaning, bolting/wrenching, brad nailing/stapling, grinding, HVLP painting, roof nailing, sanding, spraying, finish nailing and surface preparations. The pump is oil-lubricated so make sure to change the compressor oil as necessary. Since this unit will be used for both light and heavy-duty tasks, you should always monitor the oil level to make sure that it does not leak. The tank has a huge total capacity of 80 gallons. This reservoir allows for a longer run time of the devices that it will operate. It is made of cast-iron material which guarantees a long working life. The tank is oriented vertically. Although not so slim, it can still be squeezed into your garage because it is not too tall nor too bulky. 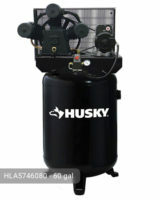 This Husky 80 gal air compressor was designed and structured to be stationary because of its large tank. It is very heavy, weighing more than 600 lbs. so do not attempt to transfer it frequently from one place to another. 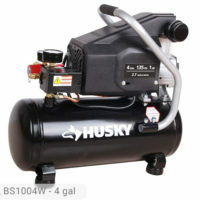 For an air compressor with powerful parts, it operates quietly (up to 86 decibels only) compared to other units. It requires a 230-volt power outlet to operate. Husky 80 Gal. 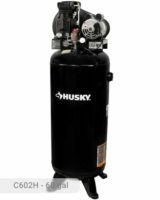 Electric Stationary Air Compressor can be bought at $2,039.00. With all the great specifications and feature that this unit has, this amount is certainly acceptable. It can be used for garage and industrial applications so you will surely get your money’s worth. All parts are made from durable materials offering a long life expectancy. If you already own Husky HV7518075 model or just want to buy it, feel free to share your review or ask a question through the form below.